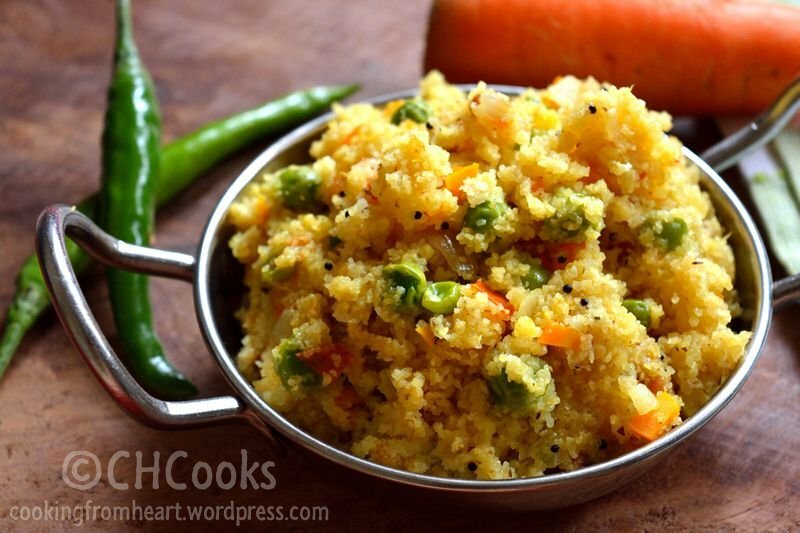 Khichadi, a South Indian breakfast recipe is not to be confused with Khichdi recipe from North India. Both are as different as chalk and cheese though the names might be quite similar. Khichadi is a popular breakfast dish and predominantly served in South Indian weddings too. 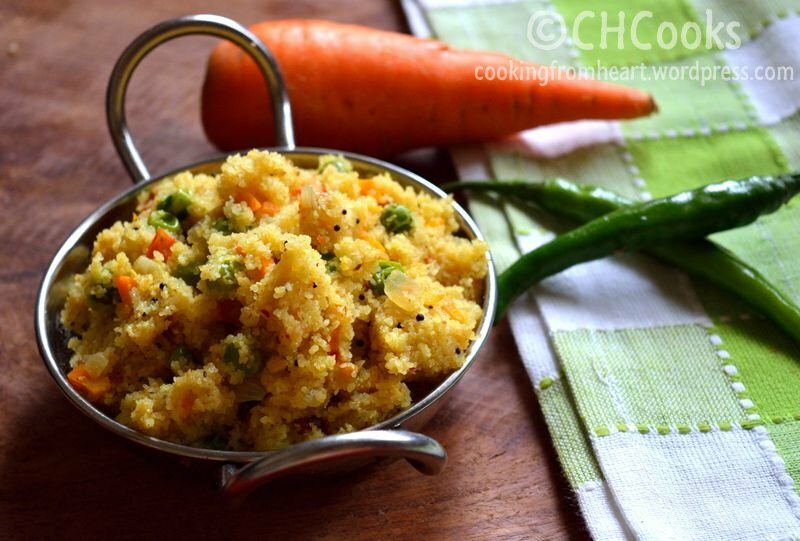 Unlike the bland usual Upma, this Khichadi has colorful vegetables added to it and is quite flavorful. Usually, semolina or sooji is used to prepare this and as I am not a big fan of the Semolina, I made it with Bansi Rava. Not only this rava is healthier than the usual sooji, this tastes much better than the semolina. When right quantity of water is added, the rava can turn quite fluffy and not too sticky as semolina. Also, this requires much lesser oil than normal upma. 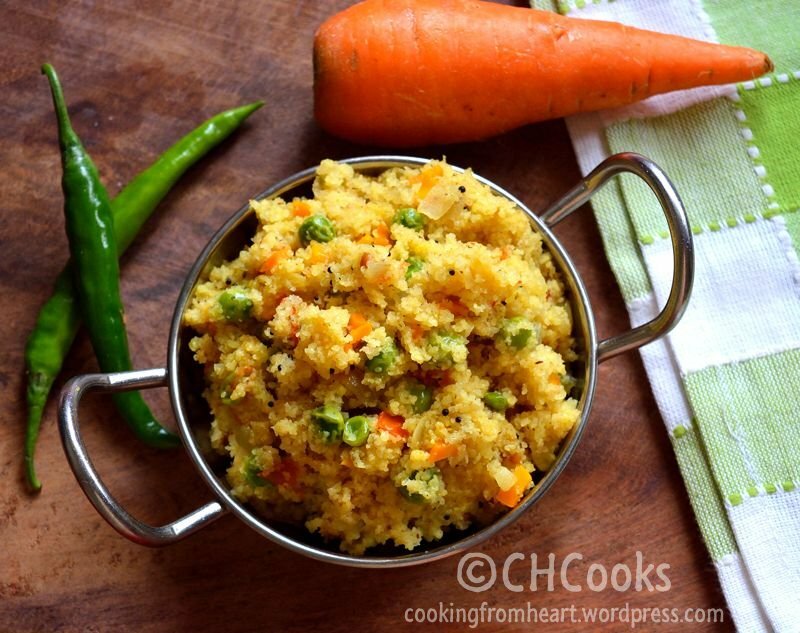 I added carrots and fresh peas while making this Khichadi as I don’t like French beans in the khichadi recipe – One can add any vegetables of their choice. In a kadai, heat oil. Add mustard seeds, urad dal and chana dal. As the mustard seeds splutter and urad/chana dal gets slightly browned, add finely chopped ginger, green chillies and curry leaves. Fry for 30 secs. Add finely chopped onion, fry until translucent. Add finely chopped tomato pieces and cook until mushy. Add finely chopped carrot and fresh green peas. Stir fry for 2-3 minutes. Add water along with turmeric powder, salt, flaxseed podi/chutney powder and let it come to a boil. Now reduce the flame to low and add Bansi rava. Stir well. Place a lid on the kadai. Let the khichadi cook on low flame for 7-9mins. On opening the lid, all the water must be evaporated and the rava should look cooked. Place the lid back and switch off the stove. Let the khichadi rest for 5-7mins. Gently mix it well. By now the rava should be fluffy and the khichadi should not be sticky. One can replace bansi rava in this recipe with normal semolina as well. I prefer the taste of this better than semolina. 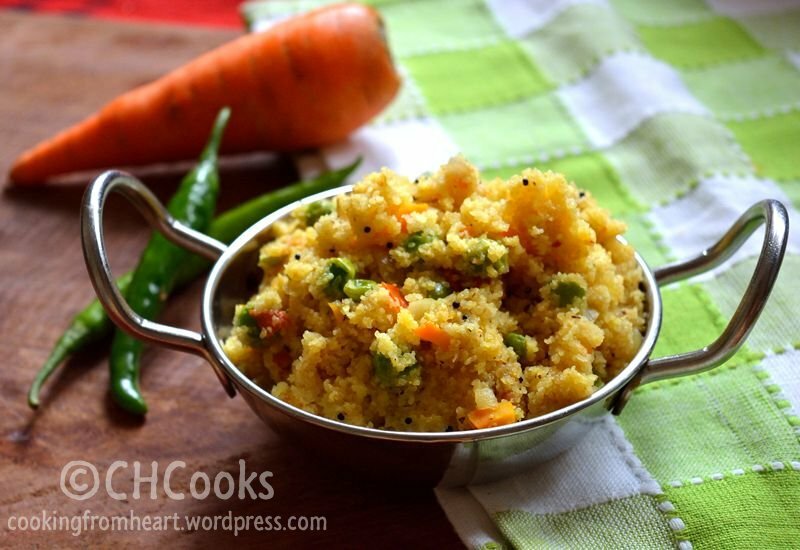 Adding chutney powder to the khichadi gives a good flavor as well as color to this dish and is highly recommended. I usually add 2 cups of water for each cup of bansi rava. Increase or decrease as per your practice.